School of Visual Arts (SVA) is a for-profit art and design college located in Manhattan, New York, founded in 1947. The college is a member of the Association of Independent Colleges of Art and Design, a consortium of 36 leading art schools in the United States. SVA offers 11 undergraduate and 22 graduate degree programs, and its stated mission is to provide "undergraduate degree programs in art and design that prepare students for entry into an array of professional fields in or related to the visual arts, while also equipping students with the skills necessary to become productive and thoughtful members of society; rigorous and practice-based graduate programs in the visual arts and its allied fields; a continuing education program intended to meet the diverse needs of New York City’s professional art and design community and the larger community within which the college resides; and a commitment to serving the greater good through community service." SVA was established by co-founders Silas H. Rhodes and Burne Hogarth in 1947, as the Cartoonists and Illustrators School. The school began with three teachers and 35 students, most of whom were World War II veterans who had a large part of their tuition underwritten by U.S. government's G.I. Bill. The college was renamed the School of Visual Arts in 1956. It offered its first degrees in 1972. In 1983, the college introduced its first graduate offering, a Master of Fine Arts in painting, drawing and sculpture. Today the school has a faculty of more than 1,100 and a student body of over 3,000. The school offers 11 undergraduate and 22 graduate degree programs and is accredited by the Commission on Higher Education of the Middle States Association of Colleges and Schools and the National Association of Schools of Art and Design. The BFA interior design program is accredited by the Council for Interior Design Accreditation. The MPS art therapy program is approved by the American Art Therapy Association, and the MA art education program is accredited by the Council for the Accreditation of Educator Preparation. ^ a b "School of Visual Arts". Find the Best. Retrieved April 7, 2015. ^ a b c d "SVA Fact Sheet". School of Visual Arts. Retrieved April 7, 2015. ^ "About". Association of Independent Colleges of Art and Design. Retrieved April 7, 2015. ^ a b Kennedy, Randy (June 30, 2007). "Silas H. Rhodes Dies at 91; Built School of Visual Arts". ^ a b c d "New Logo for SVA done In-house". Under Consideration. August 28, 2013. ^ Dalal, Alia (Spring 2010). "Military Maneuvers". Visual Arts Journal, Vol 18, No. 1. pp 4 - 7. ^ Appel, Jacob M. (May 2003). "Presidents Series: President David Rhodes: School of Visual Arts". Education Update Online. ^ "About SVA: History". School of Visual Arts. Retrieved April 7, 2015. ^ "Institution Directory". Middle States Commission on Higher Education. Retrieved April 7, 2015. ^ "School of Visual Arts". National Association of Schools of Art and Design. Retrieved April 7, 2015. ^ "Accredited Programs". Council for Interior Design Accreditation. Retrieved April 7, 2015. ^ "Art Therapy Educational Standards & American ArtTherapy Association Approved Art Therapy Master’s Programs". American Art Therapy Association. Retrieved April 7, 2015. ^ "About SVA: Academic Affairs: Accreditation". School of Visual Arts. Retrieved April 7, 2015. ^ "George Tscherny’s brushwork". Container List. School of Visual Arts. September 3, 2009. ^ "A Conversation Piece". School of Visual Arts. Retrieved September 6, 2009. ^ "Dusty Film & Animation Festival". Retrieved September 13, 2013. ^ a b c d Maurer, Mark (December 31, 2013). "Ben Shaoul developing School of Visual Arts dorm". The Real Deal. First Avenue Residence, at 407 First Avenue at 24th Street, is a 146,000-square-foot, 14-story residence hall currently under construction. The site was purchased by Magnum Real Estate Group and 40 North in April 2015 for $32.25 million from the nonprofit International Center for the Disabled. When it is completed in 2016, it will house 505 residents in 242 suites, include retail and office space, and serve as the flagship residence hall for the school. Ludlow Residence, at 101 Ludlow Street. This residential building is was most recent residence acquired by SVA prior to the Flagship Residence in 2015. It opened in 2009, and houses 350 students in features 259 single and 47 double rooms. 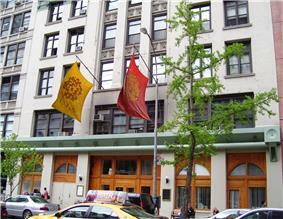 Gramercy Women's Residence, at 17 Gramercy Park South, houses only female students. Residents have a shared key to Gramercy Park. New Residence, at 215 East 23rd Street, is an apartment-style dormitory reserved for new students. George Washington Residence, at 23 Lexington Avenue. The college's Residence Life, International Students Office, Student Affairs and student government, Visual Arts Student Association, operate from the building's mezzanine level. The top-floor solarium is used for cooking, exhibitions and a student lounge. There are several residence halls available for students at SVA. SVA has three gallery spaces: SVA Chelsea Gallery, at 601 West 26th Street, 15th floor; SVA Flatiron Gallery, at 133/141 West 21st Street; and SVA Gramercy Gallery, at 209 East 23rd Street. The galleries show a mix of student and professional art; exhibitions are free and open to the public. 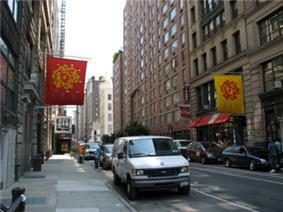 The SVA Theatre is located at 333 West 23rd Street, between Eighth Avenue and Ninth Avenue, in Chelsea. It was formerly the Clearview Chelsea West Cinema. The facility was purchased in 2008, renovated and reopened in January 2009. Designer and SVA Acting Chairman Milton Glaser produced designs for the theater's interior and exterior, including the sculpture situated atop its marquee. The 20,000-square-foot (1,900 m2) facility houses two separate auditoriums, one with 265 seats and one with 480, and hosts class meetings, lectures, screenings and other public events. The SVA Theatre has also hosted the red-carpet New York première of Ethan Hawke's The Daybreakers and a diverse list of world premières connected to SVA's educational mission and student interests, ranging from Lucy Liu's 2010 feature documentary Redlight, to the 2011 FOX animated comedy Allen Gregory; and the 2012 film The Hunger Games. Community partners that have used the theater include the Tribeca and GenArt film festivals, Mayor Michael Bloomberg's PlaNYC environmental initiative, and the Mayor's Office of Film, Theatre and Broadcasting. The theater is also home to the Dusty Film & Animation Festival, held annually since 1990, which showcases the work of emerging filmmakers and animators from the college's BFA Film and Video and BFA Animation programs. Located at 335 West 16th Street, this building houses the BFA Fine Arts Department, including sculpture studios and digital lab. 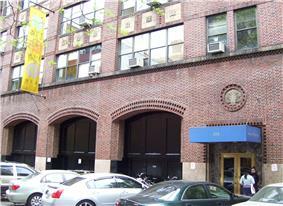 SVA also owns the buildings located at 132 and 136 West 21st Street, which have offices, classrooms and studios for art criticism, art education, art therapy, cartooning, computer art, design, illustration and writing. The building at 132 West 21st Street houses the Visible Futures Lab, a workshop featuring traditional and emerging fabrication technology, which regularly hosts artists in residence. 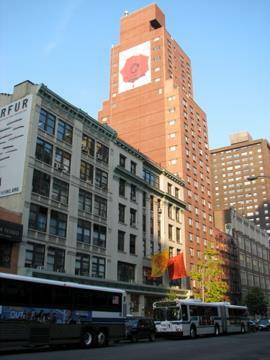 The SVA building located from 133 to 141 West 21st Street, between Sixth Avenue and Seventh Avenue in Chelsea, contains most of the studios serving drawing and painting classes, particularly for freshmen. It also features classrooms and studios for classes in interior design, printmaking, computer art and art history. The building also houses the SVA Flatiron Gallery, on the ground floor, and a cafeteria (Moe's Cafe) on the lower level. This building is where classrooms and studios used for undergraduate and graduate photography classes are located, as well as the college's radio station, WSVA, and some administrative offices. In addition to its collection of books, periodicals, audio recordings, films and other media, the SVA Library houses the Henry Wolf; and the SVA Archives, a repository for materials pertaining to the college's history. Both archives are available to the public via appointment. The college operates from several floors of the building located at 380 Second Avenue: the second, where the SVA Library and some classrooms are located; the fifth, where undergraduate animation studios and the MFA Design Department are located; the seventh, where the illustration classrooms and studios are located; and the eighth, where Humanities and Sciences administrative offices and classrooms are located. The college's 209 East 23rd Street building, located between Second Avenue and Third Avenue, features classrooms, administrative offices, a cafeteria (Moe's Cafe) and an amphitheater. The upper floors are mostly designated for the film, video, graphic design, advertising, illustration and cartooning classes. The building also houses the SVA Gramercy Gallery, on the ground floor. SVA operates out of several buildings located in the Savannah College of Art and Design. In 2014, LinkedIn named SVA #2 in its "best schools for designers" list. PayScale included the college in its "Top 10 Art & Design Schools by Salary Potential" list for 2013 - 2014. SVA is ranked 18th among the art graduate schools in U.S. News & World Report, with its MFA Photography, Video and Related Media program ranked the sixth MFA photography program in the country. Since 2012, SVA has been included on the Military Friendly Schools list, which is maintained by G.I. Jobs magazine. SVA Arts Abroad offers short-term study abroad programs in various creative fields. The Division of Continuing Education at SVA offers noncredit courses from most SVA departments; ¿Hablas Diseño?, a selection of advertising, branding, cartooning, copywriting, illustration and marketing courses taught in Spanish; professional development and corporate training courses; and summer residency programs. SVA also has three non-degree granting undergraduate departments: Art History, Honors Program and Humanities and Sciences.